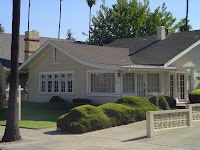 I've added a couple more pics to yesterday's post that show what the San Jose house looked like before the remodel. Still haven't gotten a hold of our in progress pics of the Mountain View Project, but here are a couple of pics of one of our San Jose projects. This is a remodel, and it's almost finished. 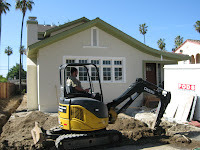 The first picture shows the sewer trench being dug out to connect the house's plumbing to the city sewer line. 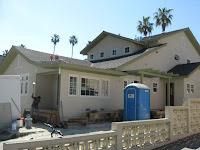 The second pic gives you a good look at this beautiful home as it nears completion. 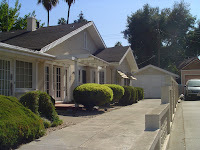 We are in the process of adding an addition to a customer's house in Mountain View. Here are the plans showing what the finished product will be. We have also included a couple of images showing the site prior to construction and preparations being made for digging out the foundation. We will be adding more photos of the construction currently in progress, in the next day or so. Follow my projects from the drafting board through construction. Watch video clips documenting the many steps that take customers' dreams from blueprints to reality.